NEWS: VOTE FOR THE OKAPI WON THE WP AWARD! VOTE FOR THE OKAPI WON THE WP AWARD! Last week my book STEM OP DE OKAPI, which translates as VOTE FOR THE OKAPI, got a very nice award: the prestigious Woutertje Pieterse Prijs, which is given to the best literary children's book of the year, chosen by a professional jury. The award is for both the text and the images, which were made by the amazing Martijn van der Linden. It was published in Holland by Querido. The book is promoted by the Dutch Literary Fund, so foreign publishers could apply for translation and production grants here. For years the okapi has been my favourite animal. This animal that is shy and majestic at the same time, that was discovered only 100 years ago (in Congo), and that bears zebrastripes as well as horns - but actually its only familymember is the giraffe. In this fullcolour book, that illustrator Martijn van der Linden and me have been working on for years, we present 88 reasons to take the okapi as your new preferred animal. The book has nine chapters, and each chapter is different. 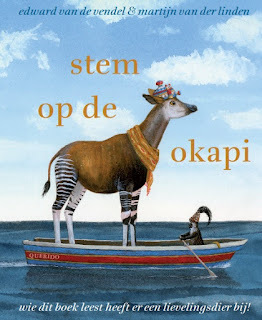 In the first one we describe the okapi from head to toe, in another one we follow an okapi-zookeeper for some (dramatic) years, there are chapters with just okapi-illustrations, there is one with 4 okapi-poems, there is the okapi museum, in which we collect okapi-pictures (made by many leading illustrators, especially for this book).